Copy of the report included in President Anderson's Collection of Papers. Response to the Report prepared by Donald Shaner and Associates. Handwritten list that appears to be a list of memos or letters sent by Dr. Anderson. A collection of documents related to the College Handbook. Contains brochures, schedules, and various other information from the Institute. 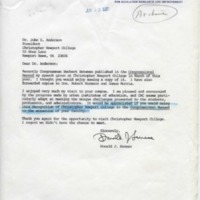 Included in President Anderson's Collection of Papers.